It is surprising that the head of Uzbek state chose to ignore some of very important events of 2012: ceasing its membership in the Collective Security Treaty Organization (CSTO), liquidating the Russian MTS (Uzdunrobita) cellular communications company in Uzbekistan, scandals around foreign bank accounts held by influential Uzbek officials, the massive scale cotton-picking campaign, the collapse of the energy industry, and power-wielders’ raids in retail markets. For foreign analysts and military experts, cooling political relationships with Russia and the military block under her patronage were one of the most discussed topics in 2012. The Fergana contributor Mr. Maksim Beylis starts a series of analytical articles with this topic. The bilateral relations between Uzbekistan and Russia were negative since early 1990s, when the Soviet Union collapsed, up to mid-2005 when the Uzbek army brutally cracked down on disturbances in Andijan. The Russian Federation threw its support behind the official Tashkent’s actions, hoping to reap an instant political benefit, via public statements and support on the international level. Uzbekistan’s Western partners, on the other hand, unanimously condemned the excessive use of force and demanded Tashkent hold an international inquiry into the event. The Uzbek authorities had one concrete response to that – No! Russia voted against UN resolutions condemning Uzbekistan. Meanwhile, Karimov shut down the American K2 military base in Khanabad, on the one hand, and joined the Russia-dominated CSTO and allowed an unprecedented number of Russian businesses to operate in Uzbekistan, on the other. However, the “thaw” in relations did not last long. Uzbekistan again left the CSTO in mid-2012 and his government launched a massive “pogrom” of Russian businesses in Uzbekistan. 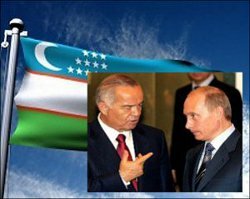 Many experts claimed back in 2005 that the improvement in Uzbek-Russian relations was a temporary and tactical maneuver on part of Tashkent. Islam Karimov was seriously concerned with a possibility of becoming an international pariah and needed Moscow as an ally for and at that time. Although the alliance looked like a sincere and amicable one initially, Karimov only needed it to win some time before he would again be able to improve liaisons with Washington, DC and Brussels; latest developments proved his tactic fruitful. By 2008, it was apparent that the Uzbek leadership considered ties with Russia a burden. The Uzbek authorities were not friendly toward the Kremlin since the very moment Tashkent declared independence from Moscow. That attitude did not change even at those times when Russian President Vladimir Putin tried hardest to display his “friendship.” For example, Tashkent did not rest even one day in its campaign to tear down statues and monuments and to rename streets that would even remotely remind of Russia or the Soviet Union. Government-controlled mass media outlets and school and university textbooks continue harshly criticizing Russia and the Soviet Union to this day. Russia always dominated the bilateral economic relations, especially in trade. For instance, despite several bilateral agreements, it is impossible to purchase Russian vehicles at official dealerships in Uzbekistan. Car purchases do not happen because of money conversion issues and the Uzbek customs service refuses to register such deals. At the same time, there is a large network of dealerships in the Russian Federation, which sell affordable vehicles assembled in Uzbekistan. Among other businesses, Russian airlines in Uzbekistan face difficult issues with bulks of non-exchangeable Uzbek currency in hands. It, therefore, appears that it is something characteristic for the Uzbek authorities to benefit from foreign partners’ losses even if that hurts their own reputation. Moscow did not offer any harsh criticism concerning Tashkent’s withdrawal from the CSTO. After all, there is not much Moscow could say, since Russia is not a valuable trading partner for Uzbekistan. Russia imports a large number of products made in Uzbekistan, including the GM vehicles assembled there, and hosts millions of labor migrants from Uzbekistan. So, should Russia introduce a visa regime between the two countries, these migrants would suffer most and such a move would deteriorate the situation in Uzbekistan, which has excessive labor force it cannot employ. But such a scenario can be ignored for the time being, since Vladimir Putin hinted in his recent public statements that Russia would keep the visa-free regime with its former subjects in Central Asia. Time will show whether these giants are to also face difficulties with Uzbek authorities. But it is safe to conclude that despite the slow down in bilateral relations and smashing some Russian businesses in Uzbekistan, bilateral traveling, labor migration and humanitarian contacts will remain. The political bad weather has not impacted the residents of Uzbekistan and their attitude toward Russia. Although the forced closure of MTS’s subsidiary in Uzbekistan, Uzdunrobita, shocked millions of Uzbek citizens. We will discuss this in the next article.